I suppose we could have seen some of the significant patterns that make Heston such an extraordinary man and such an exceptional chef the moment he walked through the door. Stocky and humble, with almost a ‘bruiser-like’ appearance and a captivating charm Heston does not fit the stereotypical image of a small village chef. But that is the point everything that he does, everything that he is comes from a metaphor of paradox. The image of the beautifully simple dish of two cubes of beetroot and orange has to be the metaphor for his legacy not only to the world of food and cooking but to the world of creativity and lateral thinking. What you see is not what you get – the blood red cube being the orange taste, and the orange cube the beetroot. In creating this twist of the senses Heston is employing some of the oldest techniques known to hypnosis as a means to creating a trance in which all our frames of reference shift and open to new experience and change. And entranced is what we were, not only with the menu of experiences and methods that he presented to us but with his remarkably rich and colourful ways of speaking. We had in the few hours that he so very graciously gave us a feast of the senses and enough strategies of thinking to fill our heads and hearts for a lifetime. The strap line for NLP is the ‘difference that makes the difference’ and Heston is a master of difference and not only difference but the unexpected. He knows how to challenge our expectations, our senses, and our thinking and in so doing make us the more enriched for it. Everything about him stems from the essence of difference. He not only owns the acclaimed Fat Duck restaurant in Bray in Berkshire but also the more recently acquired Hinds Head where in contrast to his original restaurant he is experimenting with and serving traditional English food. The group struggled to get him to slow down to model the lightning flash thinking that underpins his passion for food. And that was our challenge, not his, to respect that speed of thinking and find a way to match it. His patience with that and his attention to what was going on was amazingly multilayered. As well as continuing to present us with the images, sounds and experiences of what he offers, he simultaneously was able to relate and comment on the questions that had been raised in all part of our group as well as surreptitiously and elegantly giving feedback to his questioners. Even those who had not been to his restaurant could not fail to see how and why the customer experience must be such a delight with every need, both conscious and unconscious catered for. Surprisingly he used the term ‘barrier’ in relation to his customers but the only barrier that we could imagine was the one of not knowing what remarkable thinking goes into the whole experience of dining on his food. The values that Heston stands for in what we experienced of him in this overwhelmingly though provoking time were creativity, patience, attention to detail, paradox, awareness, connectedness, curiosity and modesty. He is a scientist as well as a chef, he is a creator and leader and simultaneously a servant and he is a world mover as a well as a dedicated family man. Above all he is a learner – his world does not stand still he opens doors to experience and ideas and listens to the voices in his head. He is a man of immense generosity as well as being someone private and shy. A list of his skills would far outstrip the best wine list in the world and include the ability to challenge tradition, to take risks, to experiment, to create paradox, to give and receive feedback, to multi task, to persevere, to respond in the moment and to create rapport at the deepest level. We engaged with him in the process of modelling and discovered metaphors of the boy in the sweetshop and the landscape of a new world whose doors opened to him in the moment that his family took him to a restaurant in the south of France as a boy. We had glimpses of strategies for testing and for ‘just doing it’ and for creativity and experimentation. More than anything else he showed us how he models his experience, unpacks the detail of what he sees, hears, tastes and feels to separate our critical and intellectual heads from our intuitive taste sensors and to play with them when we challenge them independently. I was reminded of some of the learning I did in drawing with the right side of the brain that was in effect a way of turning off the all knowing and therefore limiting left brain to allow the creative juices of my natural talent to flow. Some of the group had been to the Fat Duck previously but were planning to go again with this new understanding and curiosity to share in Heston’s’ wonder of what is possible when we challenge tradition. And those who had not been were already planning when and how that visit was going to take place. 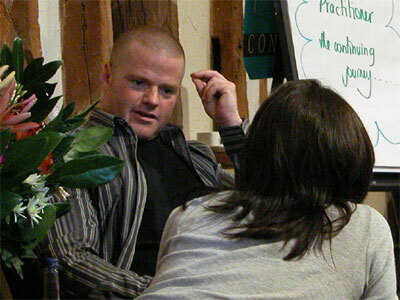 Sue Knight with input from the delegates on the NLP Master Practitioner Programme 2004/2005 Bix Manor Henley on Thames.